Jamming Range is 15-20 Mtr radius. Jam all CDMA & GSM phones. Easily to carry or wall mount. Built-in antenna design make the jammer more hidden & smart not just like a jammer. Nacon Wireless offers an extensive variety of mobile jammer in Delhi to keep the misuse of mobile phone. Mobile Jammers restrict the use of mobile by making an unsettling influence in the remote field. Jammers are not difficult to introduce and have applications in territories like libraries, examination lobbies and at events like business gatherings, meetings and so forth. To find which jammer is best for you, please visit our product page. 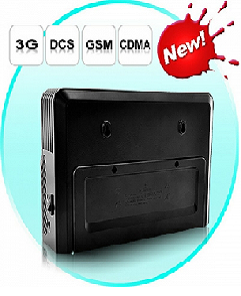 Cell Phone Signal jammer and mobile jammer has the ability to block any signal from mobile phone around. If you are a company owner you will know this amazingly well. By having such a sticking device you will not need to be fretful about being scared on the cellular telephone as no one will have the capacity to listen stealthily? Each owner will feel secured while making his front line deals or proposition on the telephone, positively, if he is using mobile signal gadget. If you interlock the signals of the mobile you will have no inconveniences while talking. Some more things that you can find out hard to imagine about signal and mobile jammer that have the capacity avoid a terrorist attack with them. Because all terrorists are using GSM frequency to speak with one another and if you interlock them they won’t do anything. Terrorism is a main difficulty for the most of the surprising firms so having a mobile phone jammer is a nice system to ensure your faculty and secure lives. If you have not used cell phone jammer maybe now is the ideal time for you to think again about mobile signal jammer – the profits of having such a gadget are noteworthy. You will realize that when you purchase a jammer. Make your home and organization safer, additionally welcome to individuals and to wrap things up. The best and most simple procedure to stick GSM signals and after that stop every cell phone around you is use an individual telephone jam.